Relational databases have a long-standing position in small and medium-sized enterprises. As volume of data is increasing industries are looking for some alternative which can serve very high request rates at very low latency. Relational database require vertical up-gradation of system(highly efficient cpu/processor) and it is a costly affair and their is an upper limit too, up to what value cpu/processing unit can be upgraded. Since relational databases(oracle, Mysql) are SQL/table oriented so the alternative databases named NoSQL(initially abbreviated as no sql later it became not only SQL) databases provides a mechanism for storage and retrieval of data that is modelled in means other than the tabular relations used in relational databases. NoSQL broadly cover to all non-relational databases. NoSQL databases follows BASE(Basically Available, Soft state, Eventual consistency) properties instead of ACID(Atomicity, Consistency, Isolation,Durability) properties. There is trade-off of preferring BASE over ACID when we are dealing with large volume of data and shifting gear from transaction processing to dealing with real time application or analytic operations. NoSQL database systems has flexible data model, higher scalability, and superior performance, however most of these NoSQL databases does not include the very foundation - expressive query language, secondary indexes and strong consistency, that has made relational databases so useful for generations of applications . Refer this article for detailed explanation about BASE vs ACID. data and real-time web applications. 2. Desire to identify viable alternatives to expensive proprietary database software and hardware. 3. Agility or speed of software development. There are long list of databases which comes under category of NoSQL ecosystem. Based on the data structure internally these database uses, it can be broadly classified in three category, it is called data model in NoSQL terminology. 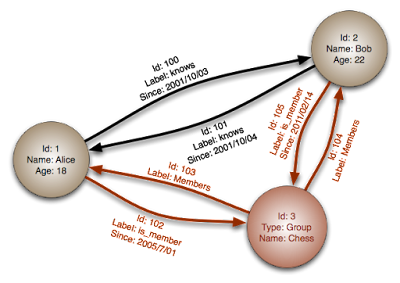 Graph model - Graph databases use graph data structure to store data. It is being used when traversing relationships are core to the application like social network connections. Neo4j and Giraph are commonly known graph database.Below diagram shows how graph model is created. Wide column model(Columnar NO SQL database ) :- Wide column model is similar to traditional relational database(consisting of table and columns) with one most significant difference : number of columns is not fixed for each record. i.e : columns are created for each row rather than being predefined by the table structure. Here record 2 and 3 having different columns, Email is added for 3rd record. Consider Wide column database as key value store with value is stored as key-value subset. Document databases provide the ability to query on any field within a document. The document data model is the most natural and most productive because it maps directly to objects in modern object-oriented languages. Key-value stores and wide column stores provide a single means of accessing data: by primary key. Document databases and graph databases can be consistent or eventually consistent. MongoDB provide tunable consistency.By default, data is consistent — all writes and reads access the primary copy of the data. However, read operation against secondary copies. Eventually consistent systems provide some advantages for inserts at the cost of making reads, updates and deletes more complex, In eventually consistent systems, there is a period of time in which all copies of the data are not synchronized. Wide Row - Also known as wide-column stores, these databases store data in rows and users are able to perform some query operations via column-based access. A wide-row store offers very high performance and a highly scalable architecture. Examples include: Cassandra, HBase, and Google BigTable. Columnar - Also known as column oriented store. Here the columns of all the rowsare stored together on disk. A great fit for analytical queries because it reduces diskseek and encourages array like processing. Amazon Redshift, Google BigQuery,Teradata (with column partitioning), Druid.